The radio latino, which takes its name from its inventor Latino Orsini, was used for measurements involved with gunnery, fortification and military surveying. 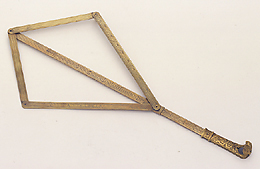 For these purposes, the hinged rods in the shape of a parallelogram, which can slide along the central rod, are provided with various scales of measurement such as the shadow square and the degree scale. The sights which were originally located at the hinges are missing. This instrument, which was conserved in the Medicean collection in Florence, is depicted amongst the frescoes of the Stanzino delle Matematiche of the Uffizi Gallery.